If you’ve been sneaker shopping in the past few months, you may have noticed something out of the ordinary: Air Jordan Retros are sitting in stores. This may seem like a normal thing for the casual footwear consumer, but it&apos;s odd for any sneaker with a Jumpman logo on it. In the past, nearly every re-released Air Jordan has been met with people lining up outside of stores and mass fanfare on Saturday mornings when Nike officially sells the product online. But that&apos;s been dying down and at an alarming rate. This past weekend saw one of the year&apos;s biggest Air Jordan releases with the "72-10" Air Jordan XIs, a sneaker inspired by Michael Jordan and the Bulls&apos; 1995-1996 NBA season. The shoes eventually sold out on Saturday, but it didn&apos;t happen instantly, which allowed most who wanted them to get a pair with some due diligence. 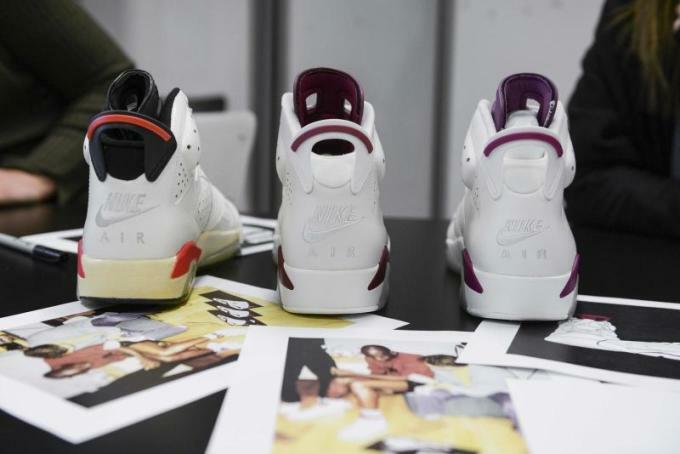 At the time of publication, there are still many sizes available of the "Maroon" Jordan VI from major retailers, including Nike&apos;s website. It&apos;s reminiscent of years ago when Jordans could be purchased weeks or months after they came out, often going on sale. But as once-anticipated Air Jordans continue to sit on shelves, one can’t help but wonder how we went from Air Jordan mania to, well, meh-nia. For starters, it shouldn&apos;t take a financial analyst to notice that Jordan Brand has flooded the market over the last couple years. Thanks to data visualization provided by Campless, we can see that there have been more than 80 general release Jordan retros from January 2013&apos;s "Bred" XIIIs up until this past October’s "UNC" Jordan 1s. That breaks down to roughly one release per week, and that&apos;s not even including limited special make-ups and collaboration releases, which there have also been plenty of. To top it off, Jordan Brand kicked off 2015 with the introduction of its Retro Remaster series, causing many models to see a significant price hike, due to a boost in the products&apos; overall quality. For example, the Air Jordan VI "Black Infrared" last year retailed for $185, while the Air Jordan VI "White/Maroon" came with a price of $220. This data also paints a clearer picture as to how these Retros are faring on the secondary market, and it turns out that the resell appeal might have more to do with Jordans not selling out than one would think. 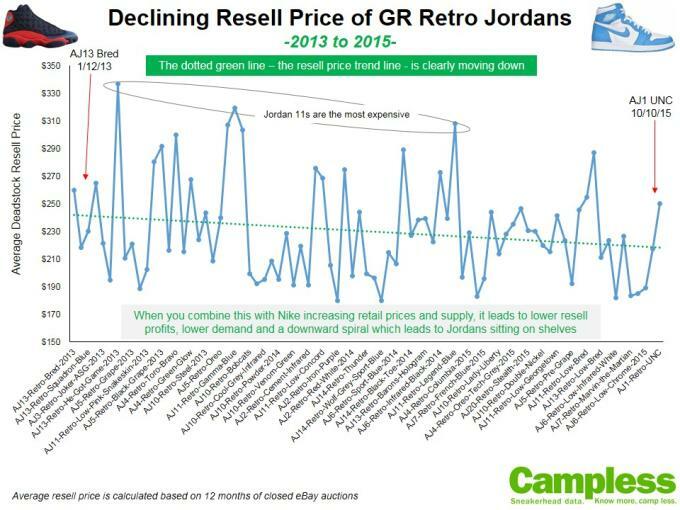 Take a closer look at the dotted line that traces the average resell prices for general releases since 2013. Although it isn&apos;t dropping rapidly, there&apos;s clearly a downshift taking place. There may be several factors to this trend and how it fits into Jordan Brand and Nike&apos;s overall plan. Earlier this year, Nike CEO Mark Parker announced that Jordan Brand was attempting to grow its business from $2.6B in 2015 to $4.5B in 2020, which means that the company will have to sell more product to make more money. According to a store manager at a high-volume sneaker store who wished to remain anonymous, a location in New York City went from receiving 1,000 pairs of an Air Jordan to roughly 1,500 pairs in just one year&apos;s time. While more people are able to get their sneakers, causing an overall higher level of satisfaction amongst sneaker consumers, it may be wearing people out, too, especially the ones who are looking to make profit on Air Jordans on the secondary market. "I&apos;m sensing a bubble in the resale market. 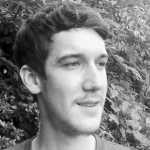 It appears that prices are in decline, which is dampening the enthusiasm of the price flippers on release shoes," explained Matt Powell, sports industry analyst for the NPD Group. Tony Chen, owner of consignment shop Soled Out NYC, was more candid on the topic. "I&apos;ve been telling people straight out, if they were to cosign it, they would take a loss. Your best bet if you are trying to do a quick flip is to just return it to the store," he says. Chen says that because the market has become so saturated, sneakerheads are always chasing that next pair, so if a reseller isn&apos;t able to flip his/her pickup on the day of release, "it basically becomes dead weight." This creates an environment where people are reluctant to purchase new Air Jordans, because they only wanted them to sell on the secondary market. And that&apos;s becoming more difficult these days. With multitudes of unannounced restocks happening on a regular basis, it&apos;s taking the wind out of high resale prices as well as giving everyone several opportunities to get the same sneaker. Still, resellers aren’t the only people who buy sneakers. While they may account for a large chunk of sales, resellers would cease to exist without sneakerhead buyers. Which begs the question of what those sneakerheads are copping instead of Air Jordans. The truth is that they still are, sort of. In recent years, we&apos;ve seen more high-profile Jordan collaborations than ever, many of which managed to steal the spotlight away from re-releases of original Air Jordan models. In 2015 alone, there were Just Don x Jordan IIs, Supreme x Jordan Vs, OVO x Jordan Xs, and the just-released Public School x Jordan XIIs. What this leads to is an energy around special products that Jordan Brand is attending for the connoisseur market, while the average buyer will be able to purchase the sneakers they desire, albeit at a premium price. It&apos;s a proposition that&apos;s able to please those who want exclusive Jordan sneakers, while allowing the general populous to wear the re-productions from the brand they grew up with. In the long run, everyone wins, even if it makes re-sellers upset right now.